The Advanced Tables plugin is an advanced solution for creating and managing table. It’s an ideal tool for creating large tables that allows visitors to sort, filter, search data. It supports pagination and scrolling on larger tables. You can also import a range of file formats including Excel spreadsheets to create tables. It is a CampusPress only plugin. 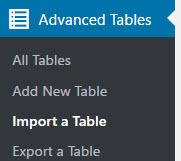 Once the Advanced Tables plugin has been activated in Plugins > All Plugins you’ll see a new Advanced Tables menu added to your main navigation. 2. Add your table name, description and specify the number of rows and columns. 4. Add your table content. 5. 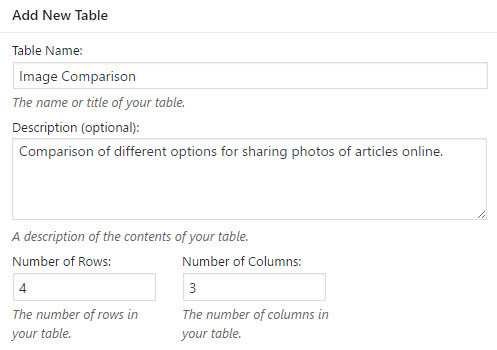 Use the table manipulation tools and table options to customize content in your cells and customize the look of your table (we’ve discuss each of these in more details below). These features are designed to be used with more complex tables where you wanted to provide visitors with advanced functionality such as the ability to sort and filter table data; or need to enable pagination and scrolling on larger tables. 7. Click Save Changes once you’ve finished creating your table. Advanced Tables includes an Advanced editor that can be used to add links, images, bold, italics. 2. 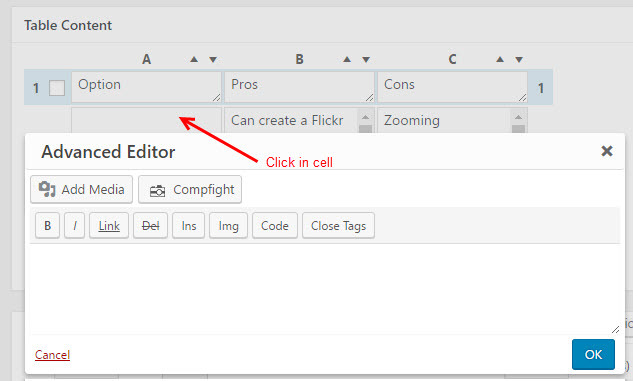 Click in the cell you want to add content to using the Advanced Editor. The Advanced Editor should launch and works the same as the text editor. Advanced Tables includes other manipulation tools in addition to the Advanced Editor. These tools work the same as the Advanced Editor. Click on the icon of the tool you want to use then click on the cell you want to use the tool in. Insert Link – allows you to insert a link into a table. Insert Image: opens the Media Library so images can be inserted into a cell. 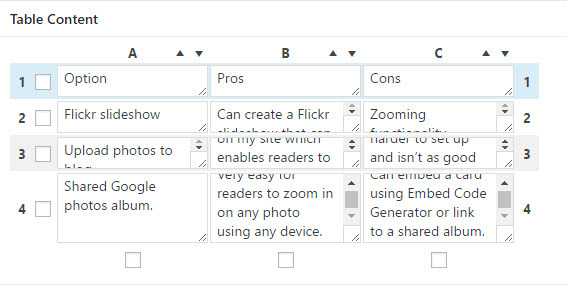 Advanced Editor: opens up an Advance Text Editor that also gives you access to Adding Media. Hide/Show Rows/Columns: select a row to Show or Hide the Row/Column. Duplicate/Insert/Delete Rows/Columns: select a row to Duplicate, Insert or Delete the Row/Column. Add Rows/Columns: allows you to add additional Rows or Columns to your Table. Table options are used to customize the look of your table. Table Head Row: allows you to set the first Row of your table as a Column Headers. Table Foot Row: turns the last Row of your table into a footer area. Alternating Row Colors: changes the colors of alternating rows. Row Over Highlighting: highlights a Row when the mouse hovers over a Row. Print Table Description: shows the table description either above or below the table. On small tables you would uncheck “Use Datatables” as your visitors won’t need the advanced functionality provided by these features. Sorting: allows your site visitors to sort columns in your table. Search/Filtering: is useful for very large tables with lots of data. Pagination Length Change: allows site visitors to change the number of Rows that shown when pagination is active. info: displays additional table information. Horizontal Scrolling: allows large tables to be horizontally scrolled. Custom Commands: additional information can be found at www.datatables.net. 2. Place your cursor where you want to insert the table to appear and click on the Advanced Table icon. 3. The Advanced Table Window will launch. 4. Click on the Insert Shortcode next to the Table you want to insert. 5. The Advanced Tables shortcode will be inserted into your post. 6. 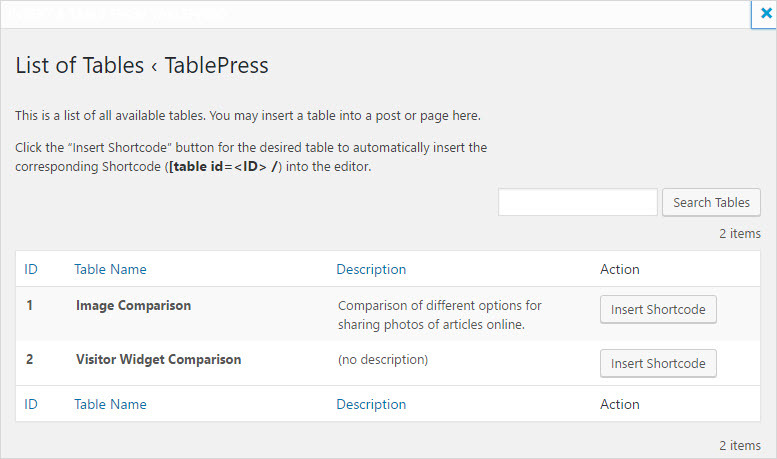 When you view your published post or page you’ll see your new table. You can import tables from existing data, like from a csv, xls, or xlxs file from a spreadsheet application, an HTML file resembling a webpage, or its own JSON format into Advanced Tables. 2. Select File Upload and click on Choose File to select the file you want to upload. 3. Select the Import Format XLSX – Microsoft Excel 2007-2013 (if it is an xlsx file). 4. Select Add as new table. 6. After the file has uploaded it will load in the Add New Table screen where you check the table contents and customize the settings. You can also export a Table using Advanced Tables > Export and import into into a new site using Advanced Tables > Import a Table. 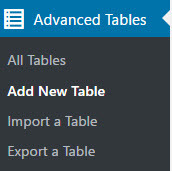 Tables are managed in Advanced Tables > All Tables. This is the area in your admin panel where you see a a listing of all saved tables. Edit: Click on Edit to open up the table in full edit mode to make changes to the Table. Show Shortcode: Displays the shortcode that is used to add a table to a post or page. Copy: Creates a copy of your table. Ideal for situations where you want to use the table, with modifications, for another use. Export: Loads TablePress > Export where you can download a copy of your table. Delete: Used to delete a table.